The SV.4 was designed as a biplane tourer/training aircraft in the early 1930s by Stampe et Vertongen at Antwerp. The first Stampes produced before the war weredesignated S.V.4. When Stampe launched the production for the Belgian Air Force, those were S.V.4b (b for bis or modified). 30 aircraft were delivered between June 1939 and May 1940. Including initial production, 35 aircraft were built before the company was closed during the Second World War. After the war the successor company Stampe et Renard built a further 65 aircraft between 1948 and 1955 as trainers for the Belgian Air Force. A licensed SV.4c version was built in France by SNCAN (Société Nationale de Constructions Aéronautiques du Nord) and in Algeria by Atelier Industriel de l'Aéronautique d'Alger, the two firms completing a combined total of 940 aircraft. The postwar SV.4Cs were widely used by French military units as a primary trainer. Many also served with aero clubs in France, numbers of which were later sold secondhand to the United Kingdom and other countries. The type has been used in several movies to represent other aircraft including Indiana Jones and the Last Crusade. The Belgian Air Force operated the type until 1970 and used it for one of its aerobatic teams. Azur/FRROM has released four different boxings of this kit and while the plastic bits are mostly the same for all the kits, there are differences in terms of some of the resin parts. Where this kit differs from other boxings is the inclusion of an intake piece that fits on the fuselage. This is due to the different engine used in the French aircraft. 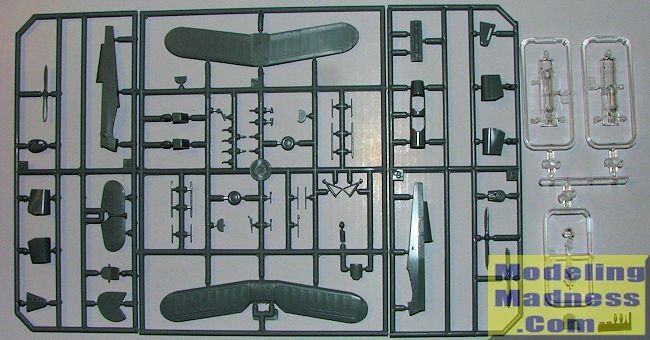 There are three grey and one clear sprue included in the box. In with the sprues are three different canopy/windscreen treatments, three different props, and two different engine cowling treatments. The instructions are quite clear on exactly which ones you use with which option. The interior is nicely done with a floorboard, two seats, control sticks and rudder pedals. There are separate front and rear instrument panels and one of the resin bits is the console for the back panel. Framework detail is included inside the fuselage halves. Both upper and lower wings are single pieces with the proper dihedral already molded in place. All of the wing struts are separate and have prominent attachment holes so building a sturdy wing assembly will be easy. For this boxing, all of the aircraft have open cockpits.The only other resin bit used is for the pitot tube on the left wing. Landing gear is properly sturdy and the plane is fitted with a tail wheel. Instructions are very nicely done and include a full rigging diagram. 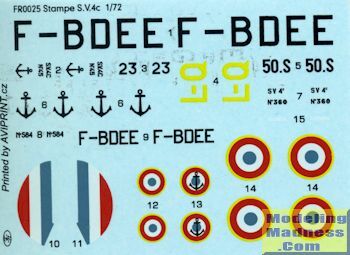 Markings are provided for three aircraft. One is the box art plane in overall silver dope from Esc 50S in 1950. This aircraft is with the French Navy. An army version from 1956 is next and this one is overall khaki brown. The third is a civilian plane from 1979. This plane has a base color of aluminum dope with the engine cowling wing and tailplane tips, as well as the fin painted in orange. The decals are nicely printed by Aviprint and the instructions use Gunze paint references. 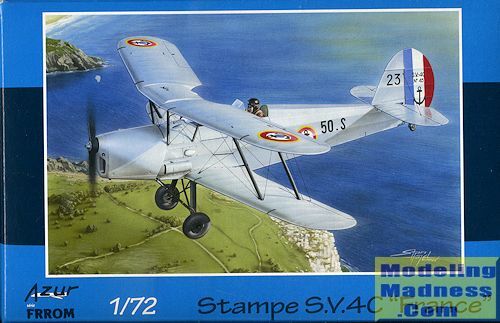 Prior to the release of this kit, the only other Stampe kit of which I was aware was by Heller to 1/50 scale. This one caters to the 1/72 crowd and really is a very nice looking airplane. I dare say that most of the extant samples still flying are of this version since so many were built. This would be my choice if doing a custom scheme. Thanks to Gilles Fontaine of FRROM for providing the preview kit. This should be available at your local retailer.